Project Overview: Students spent the morning creating some fall crafts and enjoying a cook-out before visiting a corn maze. Rationale: In order to develop complete concepts, children who are blind or visually impaired benefit from hands-on experiences in natural, real-world settings. This activity addresses the following concepts: painting, starting a campfire, cooking over a campfire, maps, and mazes. Description: The day began with each child choosing a pumpkin to paint. They used tempera paints to decorate their pumpkins. This activity gave them a chance for artistic expression without restrictions. Many children opted to paint with their hands for the ultimate tactile experience. Several children assisted in starting the campfire for lunch, which included gathering kindling and arranging the wood in the fire pit. Hot dogs and marshmallows were roasted on the fire for lunch. The children were shown where to hold their skewers and how to tell when their food was done cooking by examining the texture and smell. They were also taught how to safely remove their food from the skewer. After lunch the group walked about ¼ mile to the corn maze. The maze was set up with several trivia stations throughout where visitors could find the answers to complete a puzzle. These puzzle worksheets were provided in braille for students as needed. The children divided into teams to tackle the maze and solve their puzzles. Each team had children with low vision, as well as those who are blind. A raised line drawing and an enlarged map of the corn maze were given to each team. The children had to work together to decide where to go in the maze by consulting their maps. When they reached the trivia stations, the students who are blind located the questions on the puzzle while those with some vision found the answer at the station, using low vision devices as needed. Once all of the teams made it out of the corn maze, the group enjoyed the sounds and smells of a hayride. 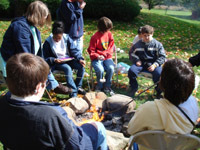 Result: Children learned about campfire safety and cooking food over an open fire. They also had the opportunity to express their creativity through painting. The corn maze activity provided an experience to explore a tactile model of the maze first and then to physically travel through the maze to reinforce their concepts. The emphasis on teamwork while in the maze reinforced valuable social skills. Locate a corn maze. The website Pumpkin Patches and More www.pumpkinpatchesandmore.org offers a state by state listing of corn mazes, hay rides, pumpkin patches, and fall festivals. Contact the corn maze site to find out if they offer group rates and explain that you will be bringing a group of blind and visually impaired children. Plan your craft. You can find craft ideas here.